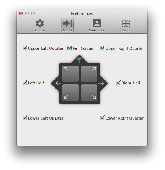 Increase productivity with multimedia keyboard macros and shortcuts. Keyboard Maniac adds another dimension to the ability to control applications on your computer using convenient keyboard shortcuts and extra keys. Put your music at your fingertips! The Keyboard Shortcuts Assistant provides you with a convenient view on the standard settings of your applications' keyboard shortcuts. Swift Keyboard is the most convinient tool for creating keyboard shortcuts so called "hot keys" not available in standard operating system. Keyboard shortcuts are supposed to provide quick access to frequently used menu commands. But honestly, how many shortcuts do you know by heart? Just press the command key and KeyCue tells you what you want to know. Add stack, queue and simple text transformations to the Windows clipboard when using the clipboard's keyboard shortcuts. Hotkeycontrol is the award winning solution to create keyboard shortcuts for routine tasks. The set of 4 utilities to enable you to assign keyboard shortcuts to hibernate or suspend the machine. Adds more than 30 procedures to Microsoft Office PowerPoint that are accessible through Keyboard Shortcuts. Assign Keyboard Shortcuts to menu items and VBA macros in Microsoft Expression Web. The HotKey QL system gives the ability to keep all the keyboard shortcuts in one central place. In addition to standard Shortcuts, HotKey QL can run scripts in the forms batch, Visual Basic scripts and Java scripts. These can be controlled using key combinations or just run from the editor. Shortcut Manager for Excel enables you to define your own Keyboard Shortcuts to menu items and recorded macros, define Shortcuts to password protected VBA macros, define Shortcuts to commands that aren't available directly through the Excel User Interface. VolconTM (Volume control) is handy system tray application that allows to control volume of computer's sounds by means of keyboard shortcuts or mouse wheel. VolconTM (Volume control) is handy system tray application that allows to control volume of computer's sounds by means of Keyboard Shortcuts or mouse wheel. The main reason why the Volcon was created is the lack of fast and easy (standard) way of master volume adjustment. DBS2K has a lot of handy keyboard shortcuts which can help save you time. F - Takes you to the football odds screen. B - Takes you to the baseball odds screen. K - Takes you to the basketball odds screen. H - Takes you to the hockey odds screen. -It enables you to define your own keyboard shortcuts to menu items and VBA macros. Install SimpleShortcuts Excel add-in and you will be able to use keyboard shortcuts to quickly cycle through number formats, cell alignments, currency formats, text colors, background colors, borders, date formats, underline formats, and many others. . Install SimpleShortcuts Excel add-in and you will be able to use keyboard shortcuts to quickly cycle through number formats, cell alignments, currency formats, text colors, background colors, borders, date formats, underline formats, and many others. Cisdem WindowManager for Mac lets you easily move, resize and arrange windows by 3 ways: drag them to the edges or corners of the screen, then theyâ€™ll be auto-resized; with grid system to select the area they should cover; or with keyboard shortcuts.